Dad’s Vegan Wild Rice, Cranberry and Pine Nut Stuffing. Gluten Free Option! My dad makes this incredible stuffing for the holidays, he always says: “Even the ‘no-stuffing eaters’ will fall in love with it” … And they do! I just found out today that I’m not going to be able to spend this Thanksgiving with my parents, so I thought I’d honor my dad this post. Makes 10-ish servings, double for your biggest holiday crowds. Method: Boil wild rice with water according to package directions until tender, about 40 minutes. Saute onions, mushrooms, celery and seasonings in the vegan butter. Saute pine nuts separately in the vegan butter until golden brown. Mix all ingredients in a large pot adding vegetable broth as you stir it in. Test for consistency and add more vegetable stock if too dry. Fluff with a large fork. Bake on low heat for (about 200 degrees) for half an hour or until golden. ← Kick Ace Extra Sharp Raw Vegan Holiday Cheddar Cheese Ball. Virtual Vegan Potluck Edition. Thanks! This is one incredibly delicious stuffing. It’s a big highlight of our family feasts. My dad isn’t actually vegan, but he veganizes many of his recipes for me when I come to stay. Such a sweetheart! Oh Nick! Fresh herbs would totally make this dish sing. My parents have a green house garden that they built this year, I wouldn’t be surprised if my dad has the herbs on hand and is all ready planning to switch things up. I’ve got to try it this year! I’m a ‘no-stuffing eater’ and I reckon I could fall in love with that too!! 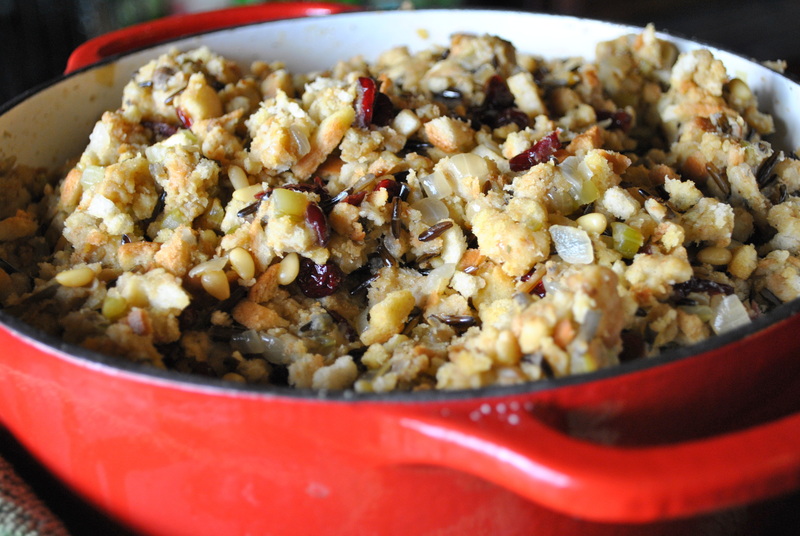 I’m getting my list together now for Thanksgiving and this stuffing has absolutely made the cut! I’m the only vegan in my family and at times that’s a pain but on Thanksgiving I take advantage of it and make all my favorites and enjoy the leftovers for days after. 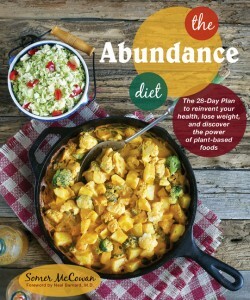 Mmmm, sweet potato casserole, cranberries, stuffing….I’m salivating on the iPad. Sounds amazing! I’m going to be alone this Turkey day so I’m going to spend the day cooking new vegan favorites as a series of new traditions! Thank you for sharing this – definitely adding it to the list! Oh no! No friends or family to share it with? You should find a local vegan meetup group and bring a couple lovely dishes to share! I just moved to a new town – but there has got to be vegan meet ups, even in a North Dakota, right? This is my adventure, so I’m not too bummed – I’ll miss everyone but it’s a great way to start fresh! I’ve never cared for stuffing – even if it’s cooked outside the bird – but this dish looks delicious and something I would love to have on my plate! Our Thanksgiving was last month, so I will note your recipe for our Christmas dinner. Usually the family asks me to bring salads and veggie dishes, but I may change it up for them and offer to bring the stuffing. 🙂 Hope you and your family have lovely Thanksgiving! That makes me really happy! This dish is surely a crowd pleaser. I hope you guys enjoy it as much as our family does! Yeah! Me too! Though I have to admit, I used to be one of the ‘no-stuffing’ eaters until my dad started making this version. So much to love about it! Pingback: Dad's Vegan Wild Rice, Cranberry and Pinenut Stuffing. Gluten Free Option! Me too! I’m so glad you like it, It really is beautiful! Hey, I need recommendations for Gluten Free Vegan Bread (store-bought variety) What do you use? Everything I can find around here has egg in it. I need to do a Gluten Free version for our Thanksgiving as I will have GF guests. All but the mushrooms, sounds great! 🙂 I adore stuffing, and am now thinking I should make 2 kinds!! Water chestnuts would be a great alternative to the mushrooms. Enjoy! oh no.. hope you see them soon for other celebrations! the stuffing looks awesome! Is that supposed to be 1/2 cup of wild rice already cooked, or 1/2 cup before cooking? Look at you with your new design :-)! Haha! Beauty of WP – you can change it as much as you want.